Size (inches): 7.87" X 5.91" X 1.38"
Over the past decade, Luv n' care, Ltd. has provided an exceptional line of quality infant products. Our growth as a company is a direct result of offering Quality and Value with a strong focus on Customer Service. Our goal is to continue to supply quality products at value-driven prices. 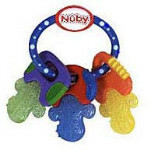 Luv n' care, Ltd. is a major manufacturer, importer, marketer and designer of a wide variety of infant care products. Luv n' care, Ltd. provides infant care products which are recognized by consumers to possess both quality and value. Luv n' care, Ltd. is an international corporation with product designs which meet or exceed both U.S. safety standards and the more demanding standards of international regulations. Luv n' care, Ltd. is a member of the Juvenile Products Manufacturers Association which is recognized as the major trade organization for infant care product manufacturers. Luv n' care, Ltd. is owned and operated in the United States. Its' manufacturing facilities and Corporate Offices are located in Monroe, Louisiana. Here designers, artists, and factory workers create quality infant-care products incorporating many beautiful and colorful designs with well known children's characters from Precious Moments®, Beatrix Potter ® and Disney Babies®.